Do Boston Terriers' Tails Curl? The Boston terrier's curly tail sometimes seems like a little bump on his rear. The rounded head and “tuxedo” coat pattern of the all-American Boston terrier make the breed a familiar sight to many people. But how many people see just the tail end of the dog and think, "Boston"? It turns out the Boston terrier is as distinctive walking away as walking toward you. Many Boston terriers have curled -- corkscrew -- tails. The Boston terrier tail commonly appears to be a button or a bun on the dog’s rear. Some are curled more tightly than others, making it seem as if the dog has no tail at all. Such a tight curl requires special attention. An “ingrown” tail can form a groove in the dog’s rear end that at best requires regular attention and cleaning to prevent infection and at worst may require amputation to prevent causing pain. Fortunately, such an extreme is not common. The same genes that cause screw tails in the Boston terrier can also cause some serious problems when they affect the vertebrae farther up the back. Most canine vertebrae are shaped like cylinders. Placed end to end, normal vertebrae create a flexible bony tube through which the spinal cord passes. 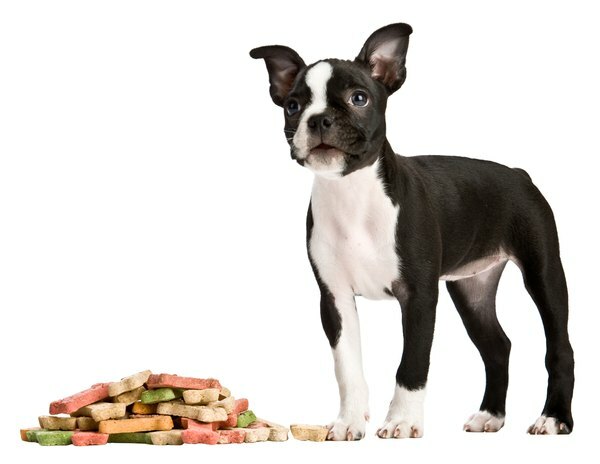 The vertebrae in a Boston terrier’s tail, though, are shaped like wedges or like butterflies. These odd shapes, when placed end to end, cause the tail to curl. Once in a while, the wedge-shaped or butterfly-shaped vertebrae occur in the dog's back, above his rear. Passing through these odd shapes may put pressure on the spinal cord, causing the dog to be unable to control his bowels and bladder, as well as causing weakness in his hind legs or even rear end paralysis. Like ingrown tails, these problems rarely occur. The American Kennel Club and the United Kennel Club breed standards both permit the Boston terrier to have a straight tail, as well as a “screw” tail. The Boston terrier tail is set low on his rear, meaning it should aim down toward the ground when he's idle. The ideal Boston terrier tail, if straight, should never be more in length than one-quarter the distance between the root of the tail (the “set-on”) to the bend of his hock above his lower hind leg. The Boston terrier is a bobbed breed, not a docked breed. That is, he is born with a short tail due to his genes, not because someone cut off any portion of his tail. Boston terriers that have docked tails can’t be shown in the conformation ring because it is a disqualification, even if the docking was due to health reasons. 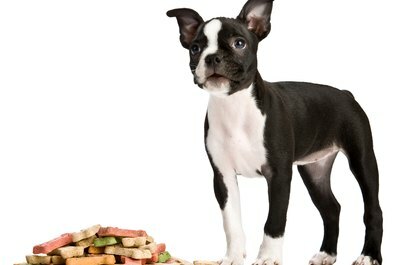 Whether show dog or family pet, the Boston terrier is a natural breed. From the tip of his upstanding ears to the tapered point of his often-curly and undocked tail, the Boston terrier goes through life as he was born. What Organization Monitors Dog Food?